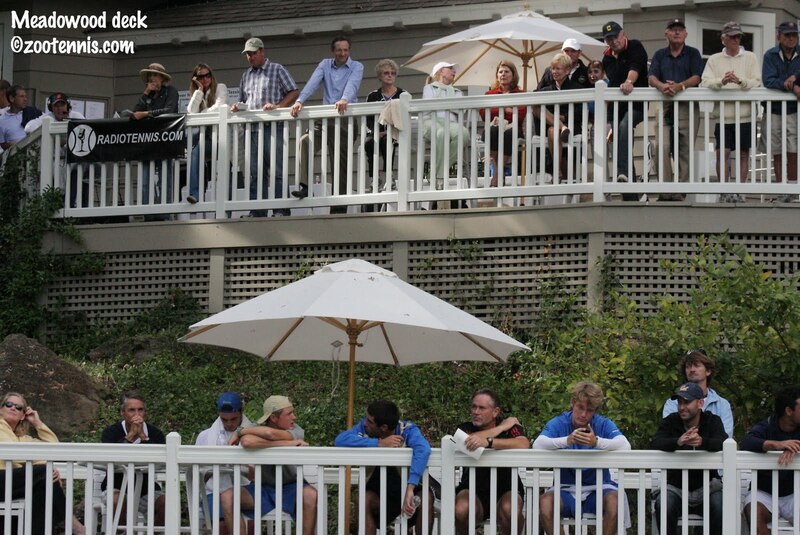 After four cold and rainy days in Michigan, I'm more than happy to look back at last weekend's Land Rover Napa Valley Tennis Classic, which featured great weather for the first two days and only a few hours of rain on Sunday. That hour or two was enough to force a couple of the robin groups to be decided by shootouts, but the tournament did finish with a champion, Nick Andrews of Cal. 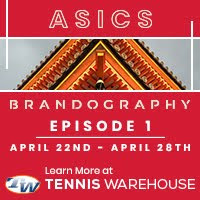 Here is my recap of the event for the Tennis Recruiting Network, and below is the slideshow, which I hope gives an idea of the beauty of the setting. Thanks to the wonderful staff at Meadowood, and to the wineries and members of the tennis community there, who made the tournament such a pleasure for me to cover again this year. For US juniors, the road to a main draw spot in the junior slams starts in places like Waco, Texas, Nassau, Bahamas and Tampico, Mexico. The ITF Grades 4s and 5s rarely require a ranking for qualifying, so they are the first step on the ladder for most players who have decided to pursue the international route. The ITF Grade 5 in Waco this week is proving an excellent choice for two 13-year-old girls, with Tornado Ali Black and Sydney Riley both reaching the quarterfinals, along with two 14-year-olds--Marie Norris and Olivia Hauger, also both from the US. Black, who hadn't played in a tournament since April, and Riley, who plays USTA tournaments regularly, have little experience in ITFs due to the organization's rule that you must be 13 years old to compete in them U18 events. The most accomplished player in the field is 15-year-old Peggy Porter, the No. 3 seed, who won both the USTA 16s Clay Courts and Hard Courts this year. The oldest of the eight quarterfinalists is No. 2 seed Clementina Eugenia Riobeuno De Paola of Venezuela, who is 17, and she will meet the youngest player, Black, in Friday's contest. The boys quarterfinalists in Waco are a much older group, with only 13-year-old Stefan Kozlov under the age of 15. Kozlov, due to his success at the Plantation ITF and the Grass Courts, is the No. 6 seed this week. 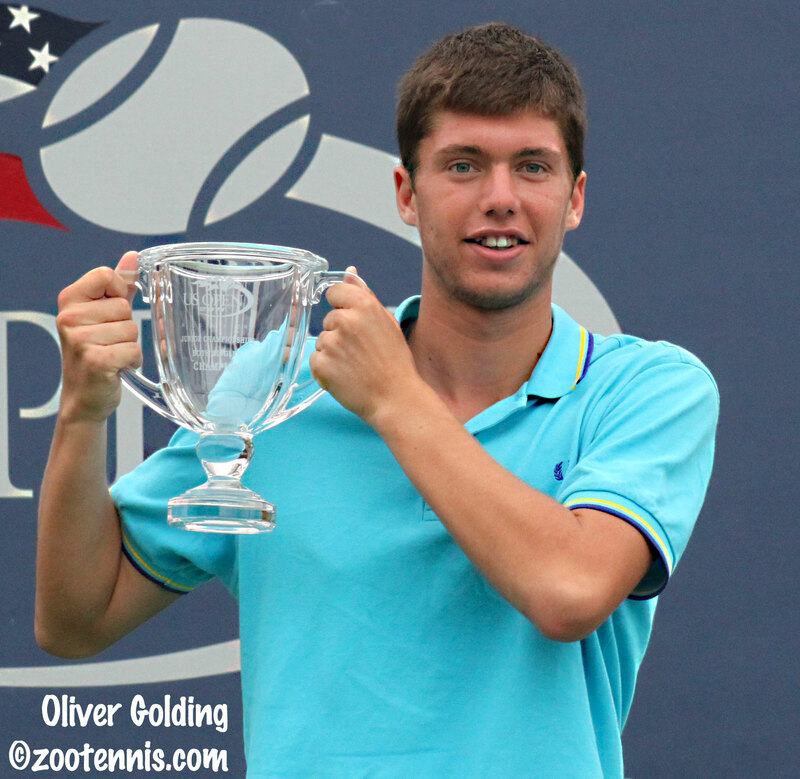 Earlier this month Kozlov won the Boys 14s Nike Junior Tour championship for United States. The USTA announced the teams for the Pan American games next month in Mexico, with Irina Falconi and Christina McHale giving the United States an outstanding women's team. Sloane Stephens had also agreed to be on the team, but due to an injury she will not be able to play. The men's team, which does not include any Top 100 players, as does the women's team, is made up of 19-year-old Denis Kudla, former Florida All-American Greg Ouellette and former North Carolina All-American Nick Monroe. Kudla, who is the top seed at the $10,000 Laguna Niguel Futures in California, will play Christian Harrison in Friday's quarterfinals after Harrison upset No. 7 seed Michael Venus today 7-5, 1-6, 6-3. In the $50,000 Las Vegas Pro Circuit event for women, wild cards Allie Will and Maria Sanchez advanced to Friday's quarterfinals. Florida Gator Will beat No. 6 seed Edina Gallovits-Hall 7-5, 4-1, ret. and former USC star Sanchez beat qualifier Krista Hardebeck 6-3, 6-2. Sanchez will play Alexa Glatch in the quarterfinals, while Will faces top seed Romina Oprandi of Italy. Sanchez has also advanced to the doubles semifinals with former UCLA All-American Yasmin Schnack. At the $10,000 Amelia Island tournament, Taylor Townsend and Allie Kiick will play in the quarterfinals, a rematch of the Plaza Cup USTA regional final I covered in Florida in January. There are no seeds left in among the quarterfinalists, and the match between Chalena Scholl and Sherry Li will also produce a second junior semifinalist. It seems like all my headlines recently are about those who are not playing, but I wanted to note that Canada's Eugenie Bouchard, who won the ITF B1 Pan American Closed in 2009, has withdrawn from next month's tournament, leaving compatriot Francoise Abanda, who is competing for her country at the Junior Fed Cup in Mexico this week, as the likely top seed. Abanda, 14, is 21st in the ITF junior rankings, and is the youngest player in the Top 50. Also withdrawing before Tuesday's final deadline was Patricia Ku Flores of Peru, ranked 32, who also would have been a top seed in Tulsa. There were no notable withdrawals in the Pan American boys field as of yesterday. On to the Pro Circuit, where there have been several big wins for college and junior players. 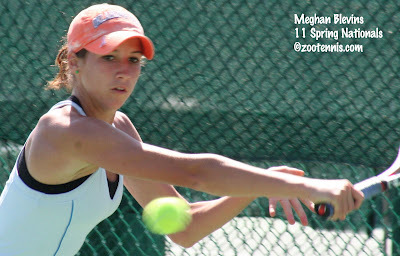 At the $10,000 women's Pro Circuit event in Amelia Island, Oklahoma State freshman Meghan Blevins knocked off top seed Alexis King in the the first round, beating the former Florida All-American 6-2, 7-5. She will next meet Taylor Townsend, who beat fellow 15-year-old and qualifier Josie Kulhman 4-6, 6-2, 6-2. I am not certain how the rules work on this level of play, but I was surprised to see that Townsend, who has the second best WTA ranking of any of the players in the draw now at 439, had to qualify, and when she did, was not seeded. I seem to recall that a year or two ago Ryler DeHeart qualified for an event and ended up being the top seed in the main draw once he did. If anyone can explain this to me, I'd appreciate it. Also advancing to the second round in Amelia Island are juniors Chalena Scholl, Hayley Carter, Sherry Li, Nadia Echeverria Alam and Allie Kiick. Former Georgia Tech and Ohio State player Kirsten Flower moved into the second round with a win over qualifier Mia King, and Marrit Boonstra won the battle of the former/current Florida Gator qualifiers, beating Joanna Mather 6-2, 6-2. At the $50,000 event in Las Vegas, University of Florida junior Allie Will posted the best win of her career, beating WTA No. 130 Kathrin Woerle of Germany in the first round on Tuesday. Will, a wild card, had also recorded another WTA Top 200 win in Redding two weeks ago, beating No. 178 Kurumi Nara of Japan in the quarterfinals of that $25,000 tournament after dropping the first set 6-0. Today, as the first round was completed, there was another upset, with Krista Hardebeck taking out No. 4 seed Mirjana Lucic of Croatia, ranked 109, 7-6(4), 6-4. Hardebeck will play wild card Maria Sanchez, the recent USC graduate, who beat junior exempt entry Monica Puig 6-1, 7-5 Tuesday. For more on that match see Steve Pratt's story at Tennis Panorama. 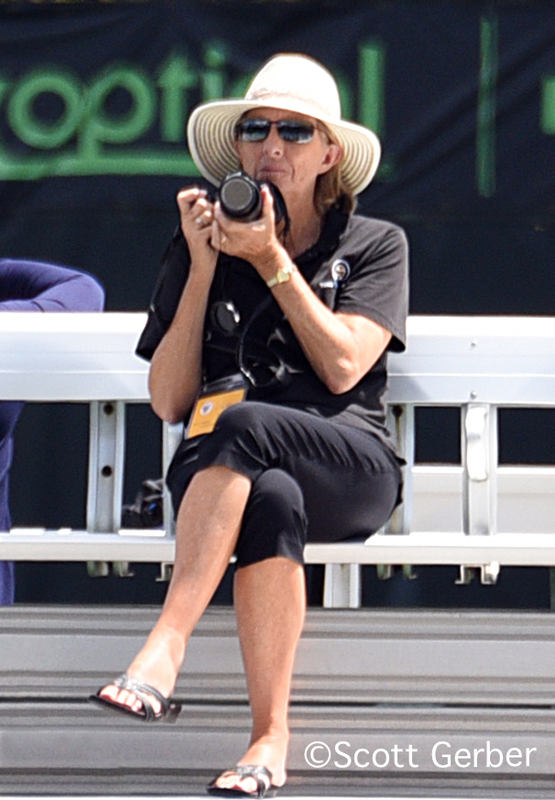 Pratt, who did the usta.com articles on the Land Rover Napa Valley Tennis Classic last week, is in Las Vegas as the press aide this week. 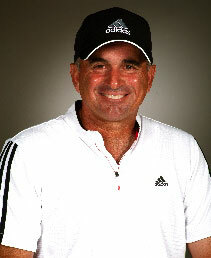 Ken Thomas of radiotennis.com is also going to be in Las Vegas, I believe beginning on Thursday. At the men's $10,000 Futures tournament in Laguna Niguel, Connor Farren, who played so well at the US Open junior championships and at the Land Rover Napa Valley Tennis Classic last weekend, picked up his first ATP point, beating lucky loser Aaron Yovan 6-1, 6-4 in the opening round. Wild card Christian Harrison, 17, won over former Fresno State star Rudy Siwy 6-2, 5-7, 6-3, and 18-year-old Sean Berman, still listed as USA, but actually under Tennis Australia's wing, advanced when his opponent retired after losing the first set. Many former college players are through to the second round, with Virginia graduate Sanam Singh posting the most impressive win. A qualifier, Singh beat No. 2 seed Dan Cox of Great Britain 6-0, 6-0. See the Pro Circuit results page at usta.com for more. The prequalifying for the ITA Men's All-American in Tulsa begins Friday, with an ITA release today containing the news that Alex Domijan of Virginia will not be defending his title due to an injury. With Domijan also occupying the top spot in the preseason rankings, that means Blaz Rola of Ohio State, who is in the draw, will be the No. 1 seed, with Kentucky's Eric Quigley, last year's finalist in Tulsa, the No. 2 seed. In addition to the Land Rover Napa Valley Tennis Classic that I covered, there were several other important college tournaments over the weekend. Jarmere Jenkins of Virginia won both singles and doubles in the top flight of Virginia's Ranked+1 event; Baylor freshman Mate Zsiga won the singles title at the HEB Invitational; Michigan's Evan King took the top flight in both singles and doubles at Harvard's Fall Chowder Fest; and Wil Spencer of Georgia claimed the Southern Intercollegiate title, defeating Quigley in Monday's final. In other college news, which is not exactly new, as it came out when I was at the US Open, Kelly Jones has been hired as the men's tennis coach at Furman, succeeding legendary coach Paul Scarpa, who retired this summer. The complete release, which includes testimonials from other coaches and players, an addition I can't recall seeing before, is at the Furman athletics website. 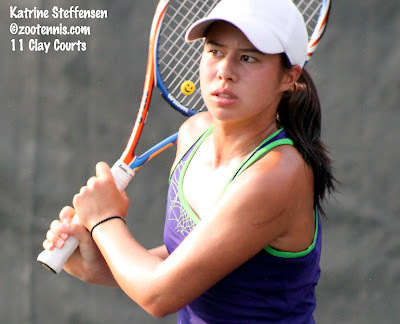 In ITF Junior action last week, Katrine Steffensen of the US won the Grade 5 in Puerto Rico, her second career ITF junior singles title. The 15-year-old New Yorker, who was the top seed, beat Rianna Valdes, also of the US, 2-6, 6-4, 6-2 in the final. Valdes and her partner Yolimar Ogando of Puerto Rico won the doubles title. Jordi Arconada of Argentina won the boys singles, with Imanol Arconada of Argentina and Luis Garcia of Panama taking the boys doubles. This week the ITF junior circuit resumes in the United States, with the Grade 5 underway in Waco, Texas. The top seed in the boys draw is Jordan Daigle of the US; the girls top seed is Camila Fuentes, also of the US. The Junior Davis Cup and Junior Fed Cup competitions began today, with the Australian girls and British boys the top seeds. Interesting to note that the Canadian girls, who would not have even been in the competition had the USA not pulled out for security reasons, are the No. 2 overall seeds. Obviously, the automatic bid for host Mexico continues to be a problem, denying a top North American team a chance to compete. I have heard the competition is moving to Europe next year, but no official announcement to that effect has been made. The official results site is here. For a simple version of results from today's action, see this page at Tennis Panorama. I'm heading back home to Kalamazoo for a week or so before my annual trip to Tulsa, so as is customary on my travel days, I'll keep this post short. 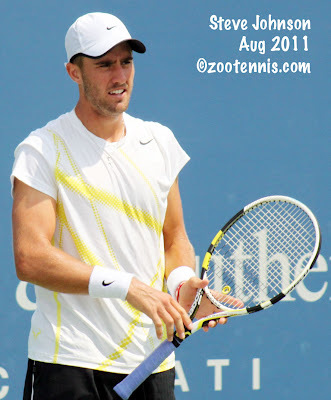 NCAA champion Steve Johnson won his second consecutive Pro Circuit Futures title yesterday, defeating No. 5 seed Artem Sitak of New Zealand 6-3, 6-3 in the final. Johnson, who was the top seed at the Claremont Futures two weeks ago, was the No. 6 seed in Costa Mesa last week. For more on Johnson's streak, and information about his upcoming schedule, see this article at the ITA website. By the way, Johnson's longtime friend and rival Bradley Klahn of Stanford, who was, like Johnson, planning to take the fall off to play in professional events as an amateur, is enrolled at school this semester. He is not completely healthy and will not play collegiate tournaments this fall, although he may compete in a few professional events if his schedule allows. The USTA withdrew the girls' team from the Junior Fed Cup Finals due to the US State Department advising US citizens against non-essential travel to parts of San Luis Potosi state. The US team will be replaced by a team from Canada. Stephanie Myles of the Montreal Gazette had a post on the situation on her blog Open Court. The ITF has a preview on their junior website, which doesn't mention the US withdrawal. 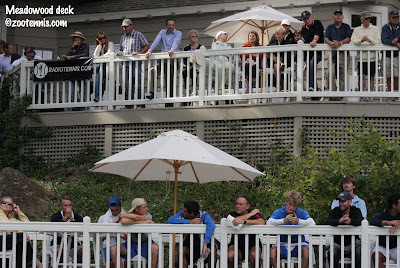 With its location and its history with Cal as host, the Land Rover Napa Valley Tennis Classic usually attracts many Bear fans, who vocally support the players throughout the three day tournament. That didn't change this year, with the navy blue and gold T-shirts and windbreakers much in evidence Friday and Saturday. But on a rain-shortened final day at the Meadowood resort, the Bear fans were eerily quiet during the wild card shootout that ends the tournament. It was not because there weren't enough Cal players, but because there were too many. 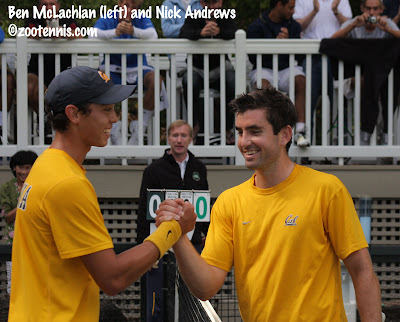 Nick Andrews ended up defeating teammate and roommate Ben McLachlan 10-7 to capture the tournament title and USTA Pro Circuit wild card, which delighted the assembled Cal fans, even if they didn't have a reason to take sides. "Obviously, this tournament is fixed," joked Cal head coach Peter Wright, as he was announcing the names of the finalists to the crowd assembled on the double-level deck that overlooks court 4. When Andrews and McLachlan took the court for the final, the sun came out for the first time all day, and whether it was nerves or the novelty of playing a teammate in an important match, the quality of play wasn't particularly high to start the 10-point tiebreaker. Andrews double faulted twice in the first seven points and McLachlan, who relies on his first serve to set up his shots, wasn't as sharp with it as he had been earlier in the day. McLachlan, a sophomore from New Zealand, took a 6-3 lead, but Andrews made it 6-5, winning both points on his serve with a patented forehand winner and a good first serve that produced a return error. McLachlan hit an ace to lead 7-5 on the second changeover, but Andrews then came up with the unlikely shot that produced smiles from both players. McLachlan was in position to rip a winner past Andrews, who was at his mercy at the service line, but somehow Andrews stuck his racquet down to his shoe tops and half-volleyed a clean winner to make it 7-6. "I got pretty lucky," said Andrews, a senior from nearby Folsom, Calif. "I made a lucky little stab pickup volley and that changed the momentum a little. I'm kind of known for the lucky shots on my team, so I guess I just pulled another one out of the bag." Despite the unlikelihood of losing a point in that fashion, McLachlan wasn't surprised. "That's a typical Nick shot," said McLachlan, who is rooming with Andrews at the home of Clay and Barbara Timon this weekend. "He pulls off shots that you just wouldn't believe. I thought I had the point, but he just comes up with something special. Too good, too good." McLachlan didn't win another point after that shot, with Andrews ending the tiebreaker with a down-the-line forehand winner. Wright and assistant coach Tyler Browne did no coaching of either player, watching from off the court, but they weren't complaining about the lack of work. "It was a dream for me," said Wright, who has brought his team to this event for the past 11 years, organizing the first nine events until turning the administration over to the USTA, so that a junior team could participate. "That's part of the excitement of this whole format, that anything can happen once a shootout starts. The guys all earned their way into the shootout, and for me, I couldn't have dreamed of a better finish to the whole event." Due to the rain on Sunday, only five of the 16 matches on the schedule were completed when the rain, which threatened to fall throughout the morning, finally arrived. Due to an early afternoon flight, the Tulsa team had to leave before play resumed after 1:00 p.m. making the process of deciding the eight shootout participants even more complicated than usual. Andrews, Ahmed Ismail of Cal and Alexios Halebian of the USTA junior national team had all advanced prior to the rain, but the other five round robin group winners had to be decided by ad hoc means due to the time constraints, with Connor Farren, Luca Corinteli and McLachlan benefiting from the Tulsa team's departure. With Vanderbilt and Tennessee also departing prior to the beginning of the shootout, several players advanced without needing to play, and two of the final eight participants were decided not by defaults but by a preliminary match tiebreaker. Notre Dame's Sam Keeton, who beat Clay Thompson of UCLA 10-5, and McLachlan, who beat Corinteli of the USTA team 11-9, earned the final two spots in that manner. After two days of competition that often involved lengthy three-set matches, the wild card shootout seems to end in a flurry of points, although it actually did take more than 90 minutes to decide the winner. 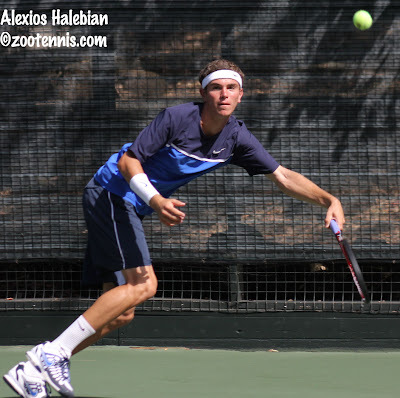 The USTA junior national team had a strong showing, with both Farren and Halebian reaching the semifinals, before losing to McLachlan and Andrews by 10-7 scores, and UCLA also had three players undefeated coming into Sunday's play--Thompson, Adrien Puget and Warren Hardie. With Cal's Ahmed Ishmail, a substitution for Carlos Cueto, who sprained his ankle a few days ago but still hopes to play the All-American tournament next month, also in the final eight, Andrews expects good things from the Bears this year. "We had a great season last year," said Andrews, referring to Cal's appearance in the NCAA Sweet 16. "We hope to build on that. We lost our top player Pedro Zerbini, but we're still looking strong as long as we're healthy." As for winning the Pro Circuit wild card, Andrews couldn't have been more pleased, not just with the result, but with his level of play throughout the weekend. "It feels amazing," said Andrews, who was presented with the Norma Miner Outstanding Player Award by tournament director Doug King of Meadowood. "I couldn't have asked for a better tournament senior year. I was really happy with my performance." 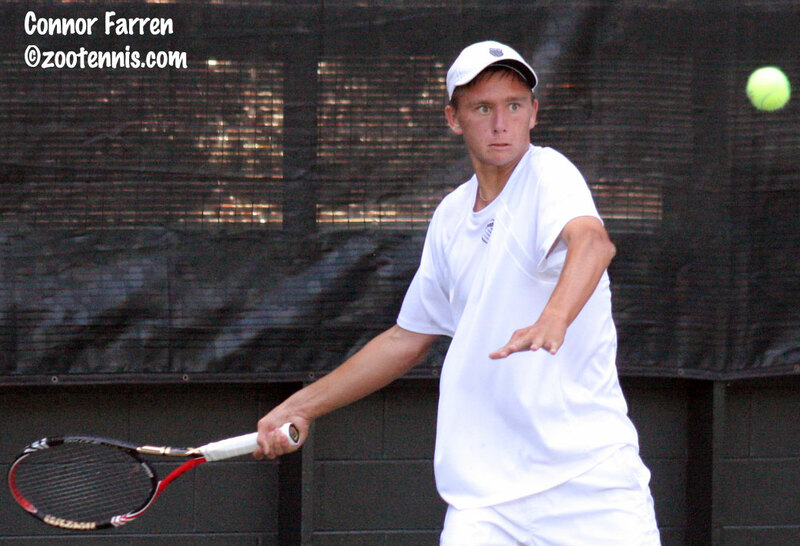 Connor Farren (USTA) advances to Wild Card Shootout after Tulsa ’s Marsland defaults. The Napa Valley attracts tourists from all over the world, and the Meadowood resort lures the celebrity variety (English soccer star David Beckham and his family are guests this weekend) but performances by Nick Andrews and Connor Farren demonstrated that those with local roots can also enjoy the special ambience of the Land Rover Napa Valley Tennis Classic. Andrews, a senior at Cal, is from nearby Folsom, Calif., so his parents and a few other family members and friends had an easy drive to watch him compete. They didn't spend much time watching him compete however, as he took out Ed Jones of Tennessee 6-0, 6-1 in a blaze of forehands and big serves. "I think it's the environment here," said Andrews, who is now 2-0 in his round robin group and will clinch a spot in the Final Shootout with a win on Sunday morning. "I made a joke with my housing [host] that I've never lost when he's watching." Andrews, who is playing in the tournament for the third straight year, also attributes his success to seeing the court well this week, but Cal head coach Peter Wright knows that the preparation Andrews has done over the summer has also contributed to his excellent results this fall. "He worked really hard this summer," Wright said. "He went over to Europe, he played on clay, did some things that were really challenging and played a lot of tournaments. We knew he's engaged in getting himself to the next level, so it's not a surprise." 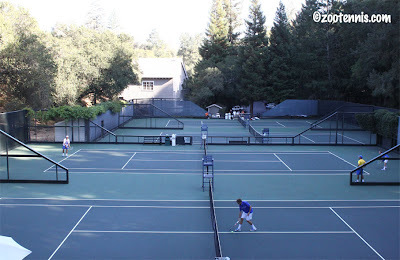 USTA junior Connor Farren is from Hillsborough, near San Francisco, so he has visited Napa several times, but he had never been to the seven courts at Meadowood's Tennis Club. "I have a couple of friends down here who live five minutes away, but I've never been to this club," said Farren, 16. "The club here is amazing." 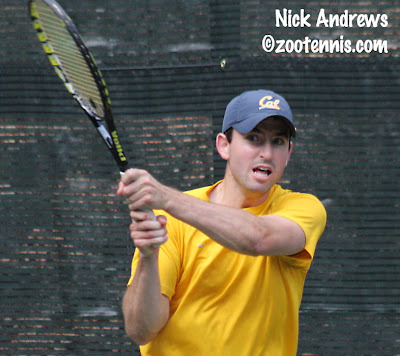 Like Andrews, Farren moved to 2-0 on the weekend with a 6-4, 4-6, 6-2 victory over UCLA freshman Dennis Mkrtchian, using the novelty of on-court coaching to his advantage. "It helps me a lot," said Farren, who is not allowed to be coached on court in USTA or ITF events. "Telling me what to pick on, whether to come to the net or stay back. I like it a lot, having a coach there." One of the pieces of advice USTA National Coach Andy Brandi gave him was to back up midway through the third set. "At 2-all he won a really close game and we talked about making an adjustment," said Brandi. "Moving back, so that [Mkrtchian] would see differently when he was serving. And he won that game at love, then he served a good game to make it 5-2." It was then that Brandi gave Farren some less specific advice that wasn't about court positioning. "At 5-2 he told me he was going to go to the bathroom, and I'd better be done with the match when he got back," said Farren. "I told him I wanted to see him picking up his things," said Brandi. "And he did it. He fought and he competed unbelievable." Farren is not the only member of the USTA junior team to enter Sunday's final match with a 2-0 record. Nikko Madregallejo beat Grant Ive of Tulsa 6-2, 1-6, 6-3 and will also play for a spot in the Wild Card Shootout with Cal's Ahmed Ismail. Ismail was a replacement for Carlos Cueto, who sprained his ankle in practice this week. Alexios Halebian will meet Notre Dame's Greg Andrews for the Group 4 spot in the shootout Sunday after Halebian beat Vanderbilt's Alex DiValerio 6-3, 7-5. Samuel Keeton of Notre Dame and Clay Thompson of UCLA will play for the Group 7 title, with Ashley Watling of Tulsa and Adrien Puget and Warren Hardie of UCLA also in position to advance to the shootout with wins on Sunday. The six members of the USTA's National Junior Team heard plenty about the Land Rover Napa Valley Tennis Classic from Mitchell Krueger and Alexios Halebian, the two players who competed in the 2010 tournament at the Meadowood resort. "I couldn't stress enough how nice this was going to be," said Krueger, 17. "I think Al and I both were talking it up pretty big, and a lot of them were telling me they are enjoying it so far: how nice the courts are, the atmosphere, so laid-back." Halebian didn't simply emphasize the virtues of the setting and amenities at the exclusive resort, but also reminded them of their responsibilities. "I told them to keep on good behavior, because it's a nice facility," said the 17-year-old Halebian, "and to try their best. We act as a team, and we try to push each other to win as many matches as we can, and that's a great part of this event." Both Krueger and Halebian came from a set down to beat their collegiate opponents on a very warm and calm day in the renowned wine valley, with Krueger downing Notre Dame's Niall Fitzgerald 6-7(5), 6-1, 6-1 and Halebian beating Japie De Klerk of Tulsa 4-6, 6-2, 6-1. "It's always tough because you don't know how these guys play," said Halebian, who last year qualified for the final shootout that decides the tournament winner. "You don't really have a game plan to go out, so it takes a few games, sometimes a whole set, to get used to their games." Krueger didn't get rattled after he dropped the opening set tiebreaker, which was decided by just one mini-break. "I missed a forehand on my serve on the second point and that was it," said Krueger. "But I think I turned it around nicely. He had a lot of slice on his serve and he was acing me a lot in the first set. It took me a little bit to figure out his serve and how to return it." Krueger and Halebian were joined in the winner's circle by team members Nikko Madregallejo and Connor Farren. Madregallejo defeated Notre Dame's Casey Watt, No. 28 in the ITA preseason rankings, 4-6, 6-4, 6-4. Watt took two injury timeouts, one in the second set and one near the match's conclusion, but Madregallejo was able, with the help of USTA National Coach Stanford Boster, to maintain his strategy and focus. "Apparently he was cramping," said Madregallejo. "Me and Stanford thought it wasn't even a focus. We just focused on our side of the court, rather than the other side." Madregallejo, 16, was happy to have on-court coaching, which is part of this tournament, which is played with ITA rules. "It changes the way I think about the match, and it helps actually," said Madregallejo. "I thought since he was cramping, I should move him a lot, make him play, make him suffer, but instead he said just play your game. You don't need to do anything special, you'll be fine." As a rookie, Madregallejo was seeing the tournament with fresh eyes, and he was impressed. "It's nice. It's ridiculously nice," he said. "It's a pleasure to be here. I'm happy I'm on this trip, and that they picked me." Farren defeated Tennessee freshman Brandon Fickey 6-3, 7-6(7) and Spencer Papa closed the day's singles action, giving the juniors their fifth win in eight matches with a 6-7(1), 6-2, 6-4 decision over Tennessee's Hunter Reese. Greg Andrews (Notre Dame) def. Alex DiValerio (Vanderbilt), 6-3, 6-4)! 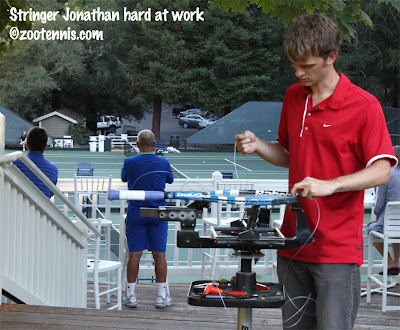 We're just getting underway here in Napa at the Land Rover Napa Valley Tennis Classic, but before we dive into that coverage, I wanted to post the link to my profile of French Open boys champion Bjorn Fratangelo for the Tennis Recruiting Network. As it was with Jack Sock last year, the speculation about Fratangelo's decision regarding professional or college tennis is intense, and I hope this provides some insight into his thought process. After an eight-hour delay in arriving yesterday, which cut short a family visit, we arrived on schedule today at Meadwood in Napa Valley for the Land Rover Napa Valley Classic. Temperatures rose into the mid-90s this afternoon and traffic in St. Helena was bumper-to-bumper, but once we reached the resort, the soothing atmosphere and the abundant shade gradually moved the stress meter lower. The plock of tennis balls from the racquets of the Tennessee and Tulsa players made up the soundtrack, and the players not hitting were on the deck with their computers, studying or entertaining themselves prior to the barbecue later this evening. Peter Wright, the Cal men's coach who founded the tournament over a decade ago, told me everything was going well in preparation for Friday's 9 a.m. start, with the exception of his own team. Carlos Cueto sprained his ankle yesterday and will not be able to compete. Casey Watt of Notre Dame is now the top seed in the event. Here is the draw and schedule for the event. Coach's Q and A: How Do I Know if I Should Retire in a Match? Harold Solomon of the Harold Solomon Tennis Institute in Fort Lauderdale, Florida provides some insight into the delicate question of player retirements in this installment of Coach's Q and A. Today's question: Retirements seem to be on the rise in pro tennis. How does a junior coach or parent know when their player should consider retiring from a match? How do you balance the health and safety issue with the desire to be seen as a tough competitor? Health and safety are of paramount importance for young tennis players. We think that it is important for players and parents to be clear about the risk/reward ratio for playing in situations which might cause long term damage to a players career. Rarely do professional or elite junior players play matches where their bodies are 100%. That said, there is a big difference between playing or continuing a match where a player has obviously seriously injured a part of their body and continuing to may cause long term damage, and playing with a minor injury such as a blister, minor ankle sprain, or strained muscle. There have been too many examples of professional players being determined to try and gut out a victory with an injury, when by continuing to play with that injury, they have actually put their careers in jeopardy. We believe that when a trainer tells a player that they are at risk of further injury or aggravating an injury, they should stop. It is important to recognize how many players also try to come back too soon from injuries and once again put their careers in jeopardy. It is our belief that you always err on the side of caution. It is easy to get caught up in the moment of an important match or tournament but it is necessary to be able to keep everything in perspective and make sure that decisions regarding a player's health and well being are oriented toward the long term. Of course players are always dealing with minor injuries, most of which are not going to have long term effects on a player's career if they continue to play on. There is a fine line between a legitimate match-ending injury and one that is nagging, and it is important that players not use those nagging injuries as a back door to stop competing in a match. I never remember retiring during a match. I always wanted to respect my opponent and let them have a real victory rather then a default. I hate when I see players retiring being down 5-2 or 5-0 in the last set. Unless you are in serious physical trouble you always should have the character to finish out the match and walk always with your head held high. Do you have a question for Tom or Harold? If so, please send it to clewis[at]zootennis[dot]com with the phrase Coach's Q and A in the subject line. 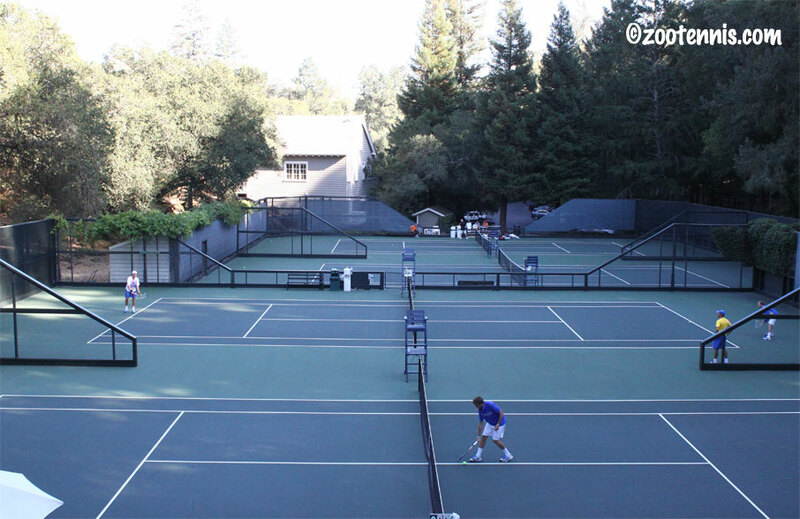 Tomorrow is a travel day for me, as I head west for the Land Rover Napa Valley Tennis Classic. 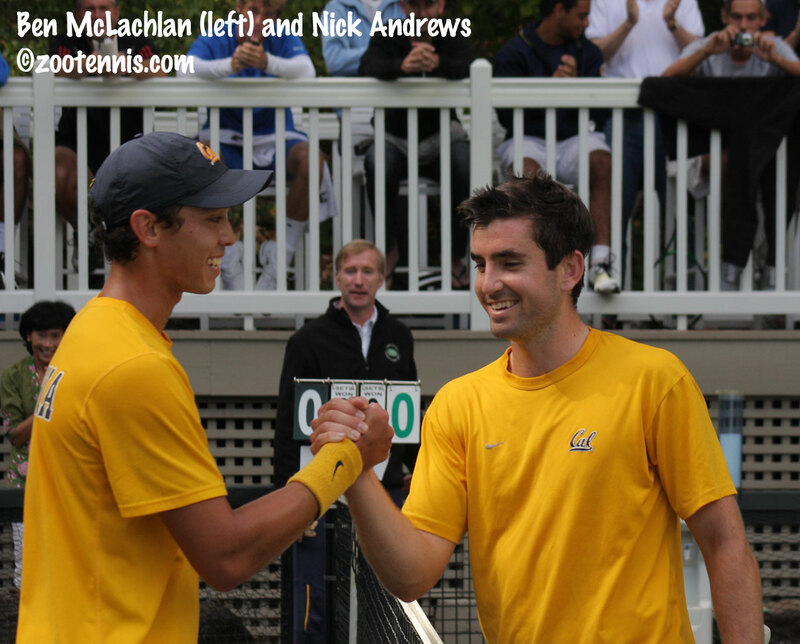 Last year I covered the tournament for the first time, which was also the first time the USTA had been involved in the event, taking over from Cal's men's tennis coach Peter Wright, who relinquished control in order to facilitate the addition of junior players. The junior players did very well last year, although Mitchell Frank was the only junior to win one of the eight round robin groups. The format this year is the same, although except for Cal, the participating college teams are new. This year the teams participating are: Cal, Notre Dame, Tennessee, Tulsa, UCLA and Vanderbilt. Unlike last year, when Alex Lacroix of Florida and Eric Quigley of Kentucky both were in the Top 10 of the preseason rankings, none of the college competitiors this year are ranked in the top 20. Carlos Cueto of Cal, at 26, and Casey Watt of Notre Dame, at 28, have the highest rankings this year. Mitchell Krueger and Alexios Haleibian, two of the juniors who were part of the inaugural group of eight last year, are returning, and they will be joined by JC Aragone, Luca Corinteli, Connor Farren, Nikko Madregallejo, Spencer Papa and Michael Redlicki. The group, selected by the USTA, are training this week at the Harbor Bay Club in Alameda, California in preparation for Friday's competition. I hope I was able to convey in my coverage of the event last year just how different it is from any other junior or college event I follow. The Napa valley is world famous for its beauty, and the Meadowood resort, where the tournament is played, is an exceptional example of the region's charm. The crowds are small but knowledgeable, with the majority of them connected in some way to the Cal program, but the amazing hospitality on offer is by no means partisan. The results in matches between collegians do count for rankings, while the juniors are there to see how their games translate to the next level. For me, it was an ideal way to unwind from the chaos of New York, and I am eager to return. I will be visiting family prior to arriving in Napa on Thursday, so tomorrow's post will be a Coaches Q and A, with Harold Solomon giving his thoughts on retirements during competition. 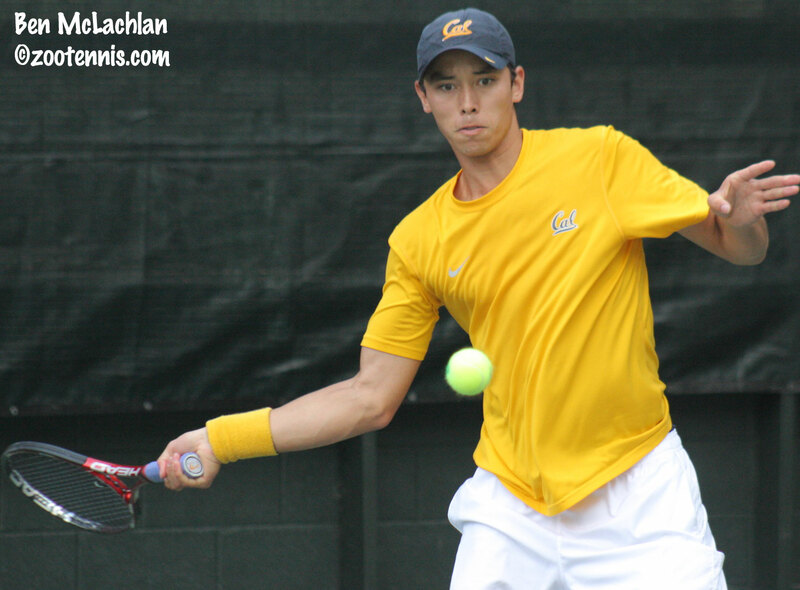 The complete list of college players competing at the Land Rover Napa Valley Classic can be found in this release, posted at usta.com. The Tennis Recruiting Network publishes new rankings every week, but the star rankings, including the highly coveted blue chip ranking for the very top players, are updated only twice a year. Today TRN revealed those rankings for the sixth graders through seniors beginning their school years now, and just a quick glance at each of these 14 lists of blue chips reveals not only many familiar names, perennially at the top, but also players who have recently moved up with their recent results. The lists can be found at this link. As I re-tweeted a few days ago, Tony Bresky has been named the men's head coach at Wake Forest, taking the position vacated by Jeff Zinn, who left to take over at Penn State. Bresky, who was at Cornell just one season, was the assistant at Wake's ACC rival Virginia for eight years. The complete release can be found at the Wake Forest athletic website. Middle Tennessee State announced last week that former Alabama player and Michigan State assistant Shelley Godwin has been hired as women's head coach. More on Godwin's hiring can be found at goblueraiders.com. There was a lot of college tennis played this past weekend all over the country, but unfortunately it's very difficult to keep track of the results of these individual tournaments. Each school sends out releases of how their players did at this or that invitational, but an overview of the entire tournament isn't available. The ITA has a results page on its website, but it isn't complete, which I assume means that the schools have not yet entered their results. Anyway, looking through the results, I did see a few interesting items. 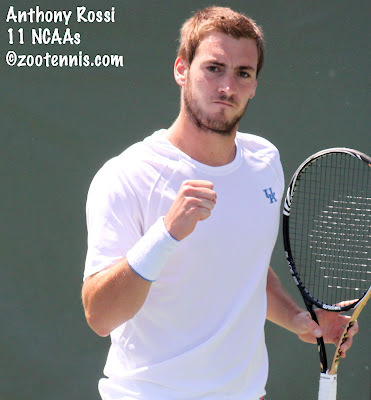 The Kentucky men's team did very well in two separate tournaments, with Anthony Rossi winning the Duke Fab Four Invite while posting a win over Duke's Henrique Cunha, ranked No. 4 in the preseason polls, and Tom Jomby, Alex Musialek and Alejandro Gomez going 10-2 at the Olympia Fields tournament hosted by Illinois. The Fighting Illini's Dennis Nevolo, No. 7 in the preseason rankings, went undefeated in that tournament, beating No. 20 Musialek, No. 25 Carlos Cueto of Cal and No. 45 Nick Andrews of Cal, along with the unranked Jomby. In women's action, Miami claimed two of the three titles at the Duke Fab 4 Invite, with Gabriela Mejia and Anna Bartenstein going 4-0 to win their flights, while Alabama's Mary Anne MacFarlane took the third flight. For more on the Miami results, see their athletic website. The results available for the past weekend also confirm that William and Mary has picked up two transfers who competed in the NCAA Sweet 16 Team Championships in May, with Miami's Kayla Rizzolo and Clemson's Maria Belaya going north to Williamsburg for this season. Danielle Mills, who also played for Miami last year, is now on the roster at South Florida. Steve Johnson, who is taking the fall semester off at USC to play professional tournaments as an amateur, won his first professional title today at the $10,000 Claremont, Calif. Futures tournament. Johnson, the top seed, beat unseeded 19-year-old Darian King of Barbados 6-2, 6-3 in the finals. After losing the first set he played in the tournament, to University of Washington's Kyle McMorrow, Johnson cruised through the next four matches, losing only 16 games. Johnson is playing the Costa Mesa, Calif. Futures this coming week and then will move up to $100,000 Challengers for his next two tournaments, in Sacramento and Tiburon California. The fourth-seeded team of Alex Lacroix of Florida and Sanam Singh of Virginia, who both completed their final year of college eligibility this spring, won the doubles title. Steve Pratt, who worked the media relations beat for the Claremont Futures this week, wrote an article about Johnson's win, which can be found at Tennis Panorama. 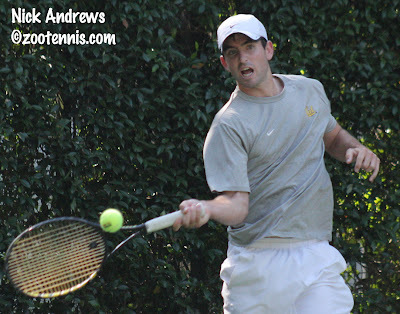 The $15,000 Futures event in Canada this past week drew a large number of current and former college players, with Jesse Levine, who played one semester for Florida back in 2007, defeating Rhyne Williams, who just turned pro after two years at the University of Tennessee, by a 6-1, 6-0 score. Levine, the No. 3 seed this week, has now won back-to-back Futures titles in Canada this month. Like Johnson, Levine's toughest match came in the first round, where he won two of three tiebreakers from Devin Britton. Williams and former teammate Tennys Sandgren, who also turned pro this summer, won the doubles title over another unseeded team made up of college teammates, Ohio State's Chase Buchanan and Peter Kobelt, who are returning to school this fall. The complete draws can be found at the ATP Challenger/Futures results page. 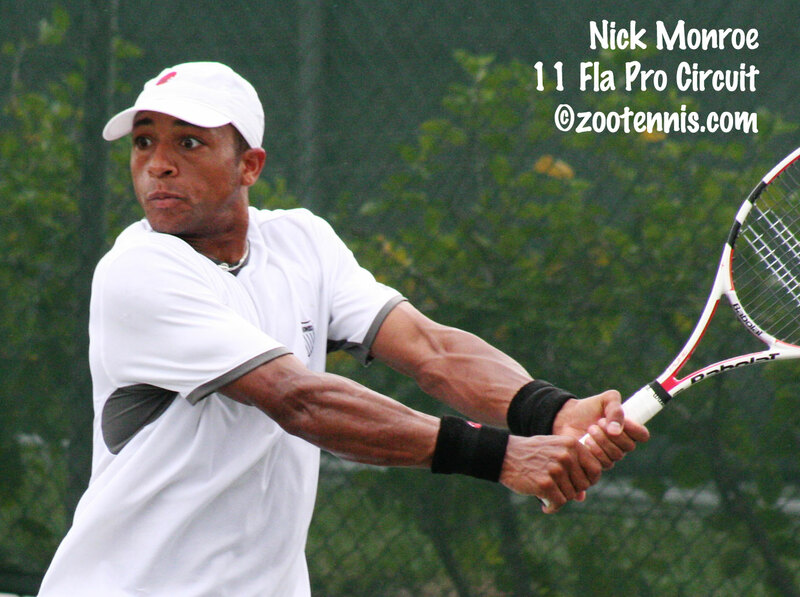 At the Tulsa Challenger, former Vanderbilt star Bobby Reynolds defended his title, defeating qualifier Michael McClune 6-1, 6-3. McClune had surprised top seed Sam Querrey in the semifinals yesterday. The third-seeded Reynolds received a walkover into the final when No. 2 seed Michael Russell was unable to play due to a leg injury. The top seed in doubles, Reynolds and David Martin won over Querrey and Chris Wettengel 6-4, 6-2. At the $25,000 Pro Circuit Women's tournament in Redding, Calif., Julia Boserup collected her first professional singles title. The No. 3 seed defeated No. 5 seed Olga Puchcova of Russia 6-4, 2-6, 6-3. Boserup had beaten unseeded wild card Allie Will of Florida in the semifinals and Lauren Davis in the quarterfinals. Top seeds and recent Pac-10 rivals Yasmin Schnack(UCLA) and Maria Sanchez(USC) won the doubles over No. 2 seeds Brittany Augustine and Whitney Jones 7-6(2), 4-6, 10-7. Qualifying for the $75,000 women's challenger in Albuquerque and the Costa Mesa men's Futures has begun. According to the Albuquerque tournament notes, US Open junior champion Grace Min has received a wild card into the main draw. See the Pro Circuit page at usta.com for draws and schedules. There is also another $15,000 Futures in Canada this week and a $10,000 Futures in Mexico for the men. And finally, the doubles title at the WTA event in Quebec went to former college players Raquel Kops-Jones(Cal) and Abigail Spears(UCLA), the top seeds, who defeated unseeded Jamie Hampton and Anna Tatishvili 6-1, 3-6, 10-6 in the final. The Kentucky International Derby, an ITF junior tournament in Lexington, went from a Grade 1 in 2009 to a Grade 4 last year, so the international juniors who are in the States for the Canadian Open Grade 1 and the US Open Junior Championships don't play it in the same numbers as in the past. Some returned to Canada to the Grade 3 being held there this week, and several US juniors also went to Montreal, where hospitality is offered, while it is not in Kentucky. Three of the four semifinalists in both the boys and girls draws in Canada played in the main draw of the US Open juniors last week, but it was American Chalena Scholl, who lost in the final round of qualifying in New York, who claimed the title. Scholl, the No. 8 seed, beat top seed Aliaksandra Sasnovich of Belarus She also topped No. 4 seed Ganna Posnikhirenko of Ukraine in the quarterfinals and No. 2 seed Zarah Razafimahatratra of Madagascar in the semifinals. Christina Makarova of the US reached the semifinals, losing to Sasnovich, and Katrine Steffensen and Denise Starr both were quarterfinalists. There were few US boys in Canada, with only No. 8 seed Austin Siegel reaching the quarterfinals. Maxim Dubarenco of Moldova won the title, defeating unseeded Samuel Monette of Canada, who did not compete in New York. Complete results can be found at the ITF junior website. 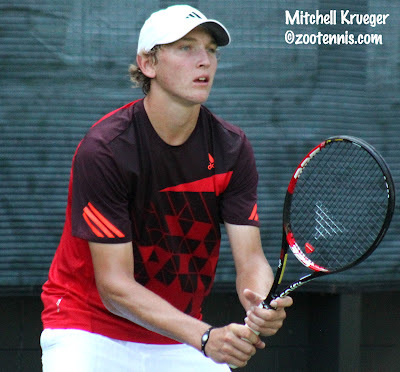 Although the field was not as strong in Kentucky, it's unlikely that matters to qualifier Paul Oosterbaan, who won the boys singles title in his first ITF tournament. Kalamazoo's Oosterbaan, who turned 16 earlier this month, lost only one set in the tournament, to fellow Midwest section competitor Brian Page, and defeated No. 3 seed Johan Skattum of Norway 7-6(3), 6-3 in the final. Page and Ryan Smith (good to see him back competing after being out most of the first half of the year) took the doubles title. USTA 16s Clay Courts and Hard Courts champion Peggy Porter, who saw her impressive win streak end in the first round of the US Open juniors, won the girls title, defeating No. 3 seed Catherine Harrison 2-6, 6-0, 6-4 in the final. Porter was the No. 9 seed. Easter Bowl 16s champion Caroline Doyle, who is also back after an injury kept her out of the Clay Courts and Hard Courts, teamed with Mia King to take the doubles. At the Grade 5 in Honduras, 15-year-old Carter Lin of the US won his second ITF title of the summer, defeating Jordi Arconada of Argentina in the final, via a walkover. The acceptance lists for next month's ITF B1 Pan American Closed in Tulsa have been posted, and as usual, the fields are strong. Mitchell Krueger tops the list, followed by Marco Nunez of Mexico, defending champion Filip Peliwo of Canada and Connor Farren. Defending girls champion Madison Keys is not entered but 2009 champion Eugenie Bouchard of Canada is, in something of a surprise. Only 17, Bouchard is limited in the number of women's events she can play, so she may be playing Tulsa for the matches and to set herself up to get into the main draws of the junior slams in her final year in 2012. Bouchard, Canada's Francoise Abanda, who at 14 is already at No. 20 in the ITF rankings, Patricia Ku Flores of Peru and Gabby Andrews are the top four on the girls acceptance list. It's time to wrap up the 2011 US Open Junior Championships with my recap for the Tennis Recruiting Network, which offers a tournament overview, and the slideshow, which I hope provides additional insight into the tournament. (There are no videos, due to restrictions placed on that medium by the USTA). Despite all the frustratingly bad weather, it was an unforgettable experience. What Explains Lack of Injury Retirements at US Open Junior Championships? Once the rain became the top story during the second week, the theme dominating the first week of the US Open, the record number of retirements, slid into the background. But I decided to follow the trend through the junior championships to see if the numbers were similar, and they most certainly were not. First, the numbers for the men's and women's singles draws. There were 10 men (correction: 11, with Tipsarevic's retirement in the quarterfinals) and four women who started a main draw singles match and did not complete it, which was not only a US Open record, but an Open Era Grand Slam record. I would guess that the men's side produced so many more due to the best-of-five format, where continuing seemed like too big a mountain to climb, but that's just speculation. (It would be interesting to see the statistics on the percentage of retirements when trailing in a match versus leading). It also should be noted that all of these retirements came in the first three rounds (the women also had two walkovers in the second round), so there were none in the second week. For the juniors, the week started perfectly. In the first round, held over two days--Sunday and Monday--all 64 singles matches ended conventionally. Monday was the first day for doubles, and it brought the first retirement, when the team of Natalija Kostic and Ayaka Okuno retired, down 6-1, 3-0 to eventual champions Irina Khromacheva and Demi Schuurs. Then came two days of rain, and no junior matches were played. On Thursday, indoors at the Sound Shore Club in Port Chester, there was one retirement, when Jessica Pegula retired in her second round match with qualifier Su Jeong Jang with the score 0-6, 6-3, 1-0. Pegula had her thigh wrapped with ice after the match, and perhaps the fact that she would have to play a second match yet that evening if she had won that third set may have figured in her decision. 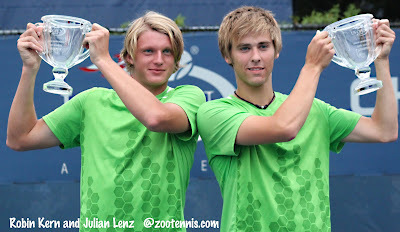 But, as it turns out, that was the beginning and the end of the 2011 US Open junior championship retirements. It's true that the girls doubles draw took a hit on Friday, when six teams received walkovers, most likely due to the prospect of three days without having a doubles match scheduled, although it should be noted there were no walkovers in the boys doubles draw. I thought I was going to see the second singles retirement in singles on Friday, when No. 6 seed Yulia Putintseva cramped badly in the third set against Nicole Gibbs, but after treatment, Putintseva, known for her often confrontational and ultra-competitive demeanor, finished the match. Those juniors who kept winning played an enormous amount of tennis on the last three days of the tournament, but still there were no additional breakdowns. The 94 boys matches in singles and doubles produced zero, none, not one, retirement or walkover. That is amazing, but I have no plausible explanation for it. Is it fair to think the money the professionals receive, which is $19,000 even for a first round loss at the US Open, provides an incentive to play when not fully healthy? Is there so much money at stake in a career that professionals will not risk the slightest chance they could make the injury worse? Is the game at the highest level played with such sheer force and athleticism that it isn't possible to avoid injury, especially after a long hard court season? I don't have any answers, but I do know the juniors, who are constantly being unfavorably compared to the pros, surpassed them in sheer toughness this time. There weren't any USTA Pro Circuit tournaments in the three weeks of the US Open (including qualifying), but there are always plenty of other tournaments in the ITF Men's and Women's Circuit tournaments around the world, so I thought I'd take a few minutes to catch up on those results. At the $15,000 Futures event on clay in Canada, former Florida Gator Jesse Levine, the No. 3 seed, defeated Jordan Cox, the No. 5 seed, 6-2, 6-2 to win his second ITF men's circuit title of the summer. Levine is the No. 3 seed this week at the $15,000 hard court Futures in Toronto, which is filled with current and former college players, including Rhyne Williams, Chase Buchanan, Sekou Bangoura Jr., and Tennys Sandgren and Hunter Callahan. Junior Filip Peliwo of Canada, who qualified at the US Open Junior Championships in New York and reached the third round, won his first round match as well. 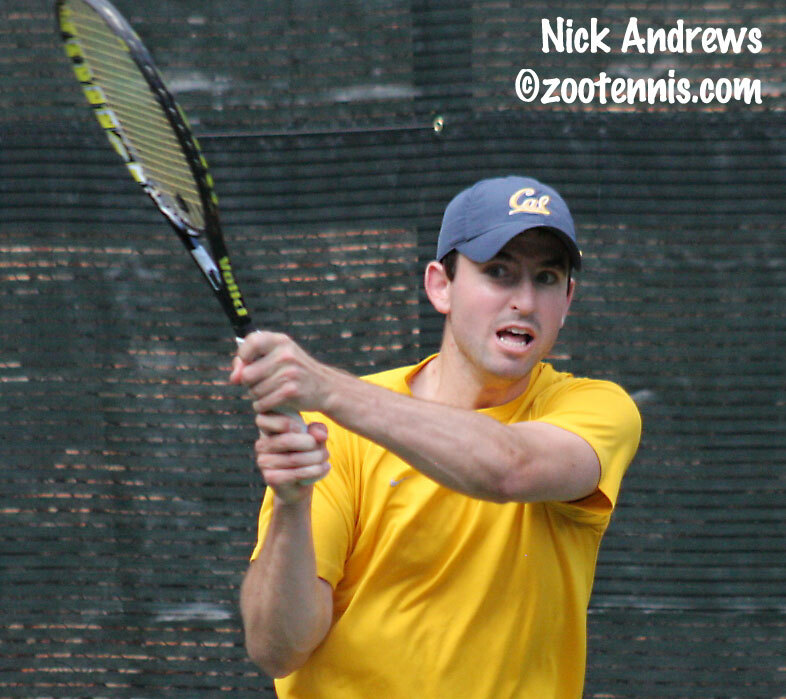 Former UCLA Bruin Michael Look of Australia won the $15,000 tournament in Alice Springs, Australia. The No. 5 seed beat No. 2 seed Ben Mitchell of Australia, the 2010 Wimbledon boys finalist, 6-4, 6-4. Connie Hsu, who spent her freshman year at Penn before turning pro, won her second ITF Women's circuit title of the summer last week in Turkey. The 19-year-old, who was seeded No. 3, beat No. 2 seed Christina Shakovets, a 17-year-old from Germany, 6-4, 6-0 in the 10K final. Former Northwestern Wildcat Samantha Murray won the doubles title last week in the ITF Women's Circuit $25,000 tournament in Alice Springs. The ITA had a comprehensive recap of the performances of all the former college players at the US Open in this post. My friend and colleague Josh Rey, who now works for the ITA, has been very diligent in keeping tabs on the former college players in the pro ranks, and wrote regularly about them during the US Open. There are three Pro Circuit events in the United States this week, with a $25,000 women's Challenger in Redding, a $10,000 men's Futures event at Claremont and a $50,000 Challenger in Tulsa. Steve Johnson is the top seed in Claremont, and he won a tough 6-7, 6-4, 6-4 match over qualifier Kyle McMorrow of the University of Washington today in his opening round match. Another Southern California product, Sam Querrey, is the top seed in Tulsa and he is through to the second round. Querrey is returning from elbow surgery and will be playing Challengers to try to boost his ATP ranking, which has fallen to 125. Jack Sock was given a wild card at Tulsa and lost his first round match to Alex Bogdanovic of Great Britain 6-2, 6-4. Dan Kosakowski, who left UCLA after his freshman year, is into the quarterfinals in Tulsa. Camila Giorgi of Italy tops the Redding field, which includes current collegians Allie Will of Florida and Ellen Tsay of Stanford, both of whom have advanced to the second round. For more on Will's win over No. 7 seed Tammy Hendler of Belgium, see this article from the Redding Record Searchlight. 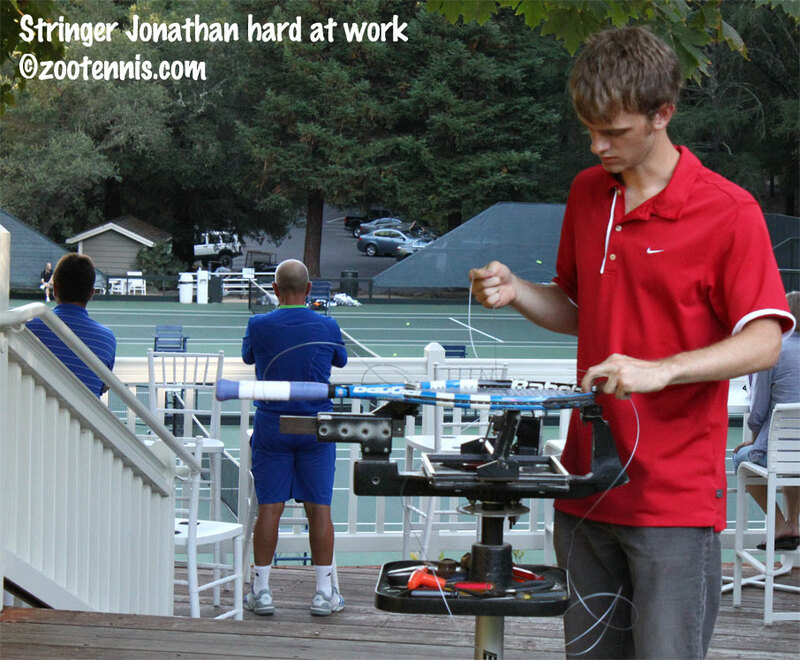 For more results, see the Pro Circuit page at usta.com. It's time to begin preparing for the college tennis fall season, which begins this weekend on many campuses. I have three college individual events on my live coverage schedule for this fall, the Land Rover Napa Valley Tennis Classic which is next weekend, hosted by Cal, the ITA Men's All-American in Tulsa in October and the USTA/ITA Intercollegiate Indoor Championships in New York in November. The ITA released its preseason rankings last Friday, with Virginia's Alex Domijan and NCAA champion Jana Juricova of Cal starting the year in the top spots. Bradley Klahn of Stanford and Steve Johnson of USC are taking the fall off to compete in professional events as amateurs. Mitchell Frank of Virginia, Yannick Hanfmann of USC and Mate Zsiga of Baylor are the top three in the men's freshmen/newcomer rankings. Trice Capra of Duke, Robin Anderson of UCLA and Ellen Tsay of Stanford are the top three in the freshmen/newcomer rankings. The complete rankings can be found at the ITA website's ranking page. The All-American fields were announced at the same time as the rankings and the men's tournament, which has a 64 field, features four Ohio State Buckeyes and four Virginia Cavaliers, which includes Mitchell Frank, who received the ITA wild card. The list of selections and other tournament information is available here at the ITA tournament page. The women's Riviera All-American is a 32 field, with Trice Capra getting the ITA wild card. Three Stanford players--Mallory Burdette, Nicole Gibbs and Stacey Tan--are in, but Kristie Ahn, who would have qualified based on her ranking of 15, is not on the list. For the complete women's field and more information about the tournament, see the ITA tournament page. And finally, the NCAA investigation into Boise State athletics, which resulted in athletic director Gene Bleymaier losing his job last month, is complete and the report has been issued. The women's tennis team was barred from postseason play for a year, and cannot recruit internationally for two years. For a concise synopsis of the punishment, see this story from KVTB.com. At the bottom is a link to the full 73-page NCAA report if you are interested in seeing how minutely detailed these investigations can be. Although I didn't have nearly as physically demanding a week as the juniors, who were required to play so many matches in so few days due to the rain, I'm tired from the late nights of writing, so I'll keep this post short, with just a few links. I had heard some time ago that Tim Mayotte had left USTA Player Development after less than two years with the organization, but for a variety of reasons, there is a lot of turnover among the national coaches, and I wasn't able to find out exactly what led to his departure. This article from the New York Times, which had one of the blandest headlines in newspaper history ("Some See Decline in US Tennis") until it was changed this morning to something a bit snappier, provides a pretty good hint. “American tennis is in the sorriest state it has ever been,” said Tim Mayotte, a former top-10 player. Mayotte resigned as the head of a program in Flushing over what he called “very openly spoken reservations” about the U.S.T.A.’s approach. In a recent interview, he criticized “antiquated coaching methods” that emphasize long hours swatting balls rather than learning technique and movement. Mayotte also said the U.S.T.A. was too insular, opportunistically luring talented players and putting them under the tutelage of inexperienced staff. He favors the approach of the French tennis federation, which identifies and supports independent coaches who do good work. I thought the USTA (I hate those New York Times periods) was doing that through the Regional Training Centers, but since I'm not living that life, I can't say for sure. But this is likely to be the only Player Development article from the US Open, because there was no press conference by Jose Higueras and Patrick McEnroe this year, despite two days of rain. This year seemed like a great time for a press conference, with the performance of some of the young American players giving optimism to journalists who normally have little use for it, but perhaps it isn't necessary then. Jon Wertheim of si.com had his brief observations on this and many other US Open-related issues here. I thank him for including my article in the junior mention. I had the pleasure of sitting with Greg Couch for the second set of the mixed doubles final (by the way, he loves tennis) and this is his article about Melanie Oudin and Jack Sock's victory. 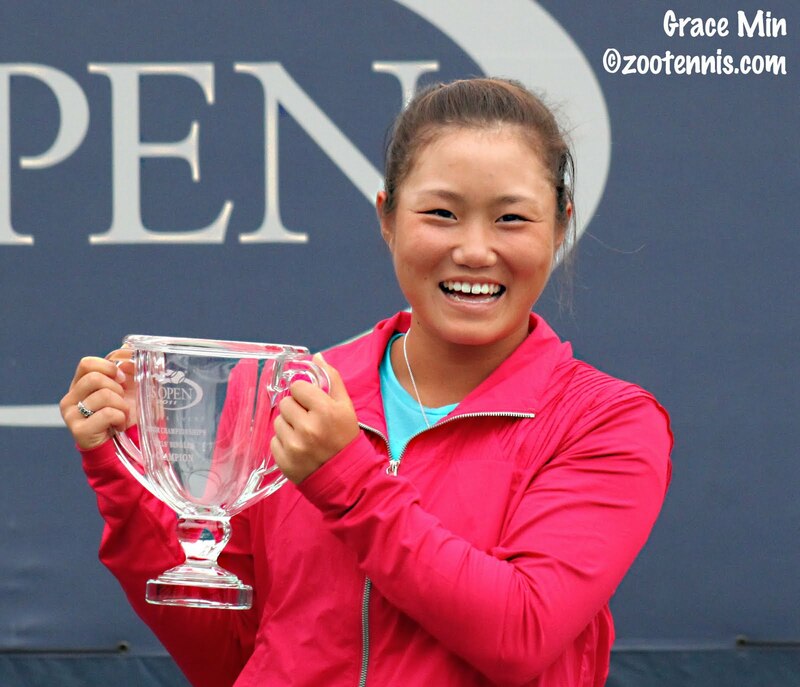 And the new junior rankings are out today, with US Open girls champion Grace Min taking the No. 4 position and Irina Khromacheva of Russia moving back up to No. 1. Daria Gavrilova, the ITF's 2010 World Junior Champion, has dropped all the way down to No. 82, and it's not because she hasn't been playing junior events. US Open boys champion Oliver Golding of Great Britain is up to the No. 3 spot, bumping Roland Garros boys winner Bjorn Fratangelo down to 4. Jiri Vesely retains his top spot. George Morgan(8) and Liam Broady(10) give Great Britain three top 10 players. 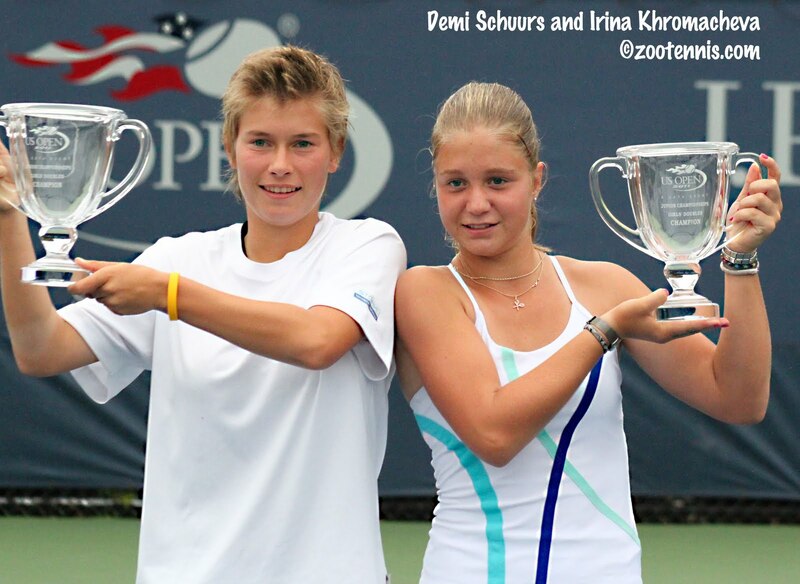 Rankings and the ITF's coverage of the US Open junior championships can be found on their website. 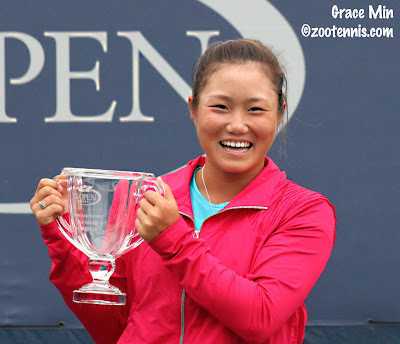 With the US Open junior champions plagued by rain throughout the week, it was only fitting that yet another such disruption would mar the finals, and at a very inconvenient time for unseeded American Grace Min. Having won the first set from Caroline Garcia of France 7-5, Min had just broken the top seed serving for the set at 6-5 when the first few drops started to fall from the uniformly gray skies. The tiebreaker began in the light drizzle, and Min, playing defense and forcing forehand errors from Garcia, took a 4-0 lead. Serving at 4-0, Min, with her Michael Chang-like legs, used her speed to run down Garcia's powerful ground strokes. Garcia hit a drop shot, then approached the net to finish the point, only to see Min's backhand cross court pass dip by her for a clean winner and a 5-0 lead. With the adrenaline from that shot undoubtedly giving Min even more confidence and momentum, the rain began to intensify and play was suspended, sending the several hundred spectators clattering out of the steep bank of bleachers that loom over Court 7. Although the rain was light and didn't last long, the delay still amounted to over thirty minutes, but it was a situation Min was all too familiar with. In her semifinal win Saturday over Nicole Gibbs, Min had won the first set 6-3 and was playing outstanding tennis when the rain came at 1-1 in the second set, resulting in a two-hour delay. "I was kind of disappointed that we had to stop, because I had the momentum, but I thought it was a good place to stop being up 5-0," said Min, who agreed that Saturday's experience had helped in coping with the interruption. "I tried not to focus on the rain or the delay and just keep warm and stay focused." As she had done on Saturday, the 17-year-old from Duluth, Ga. came out as if she had just hit that passing shot winner moments ago. Garcia, who had all sorts of problems with her serve in the match, again missed her first. Min was waiting for her second, and blasted a forehand winner to give herself six match points. "It took some pressure off me to run down balls and close it out quick," Min said of that return winner, which had to further discourage Garcia from contemplating a miracle comeback. "It kind of gave me room to breath and be creative, and not so nervous or tight." Those six match points were a luxury Min was glad she had when Garcia hit an ace and Min dropped the next two points on serve, with Garcia still determined to go for her big shots. Garcia again failed to get a first serve in on the fourth match point, and Min did not get tentative, hitting some bold forehands of her own deep into the corner, the second of which an off-balance Garcia sent long. Once the ball landed well wide and long, Min gave a fist pump and indulged in an audible c'mon, but there was no dramatic celebration for collecting her first grand slam singles title. "I thought about it for like a second, and I was like, no, you can't think about that. You haven't even won yet," said Min, who added, "stuff like that makes me nervous. And who wants to plan like that? It has to be natural." After losing in the first round of the ITF Grade 1 in Canada last week, Min went back to the USTA National Training Center in Boca Raton, where she has trained for three years, to prepare for the US Open with National coach Troy Hahn. "She's done everything we've asked over the last couple weeks," said Hahn, who recently began working with Min in Boca. "The practice leading up to the US Open was fantastic. I told her there were three things she could control, which is competing, her composure and outworking her opponents. Those things are in her hand every time she goes out there and she did it to perfection. And that's why she's walking away with the title. I couldn't be more happy for her." While Min kept calm throughout the match, even after losing a 4-1 lead, Garcia was much more volatile. Although she wasn't warned by the chair umpire for several clear instances of ball and racquet abuse in the later stages of the first set, and stormed off the court to the bathroom after surrendering the first break of the first set serving at 5-6, Garcia, who will be 18 next month, settled down in the second set. A very composed hold of serve at 4-5 in the second and a break in the next game gave her a chance to serve for the set, but her forehand deserted her in the next game, and three forehand errors led to the tiebreaker. "I didn't serve very well," said Garcia, who committed ten double faults. "That's very important in my game, and today it was very difficult. I serve always second serve and she can pressure me. In the second set I start to change a little bit my game, be more aggressive and play my game, but I start too late." Min had no plans for a celebration, although she said she would like to see Phantom of the Opera on Broadway if she can. As for her tennis schedule, Min said she would compete in the Pro Circuit challengers in Albuquerque and Las Vegas, but is undecided as to whether she will play any more junior slams, although she has another year of ITF junior eligibility remaining. The boys final, played on Court 11 at the same time as the girls final, also saw the No. 1 seed fall at the last hurdle, with No. 13 seed Oliver Golding of Great Britain defeating Jiri Vesely of the Czech Republic 5-7, 6-3, 6-4. Golding, who turns 18 later this month, had just won the second set when rain stopped play. When the match resumed, Vesely and Golding, who had reached two junior slam doubles finals as a team, held serve until 3-3 in the third, when Golding broke on his first and only break point of the set. Consolidating the break with some massive forehand winners, Golding was only two points from the match with Vesely serving at 3-5, 15-30, but the 6-foot-6 Czech hit a couple of good serves to force Golding to serve it out. Given the difficulty he had in the first set, when Golding couldn't convert on any of his four set points, and in the second, when he finally evened the match on his fifth set point, his routine hold in the final game of the championship came as a surprise. "I didn't think it was going to be that easy, to be honest," said Golding, who is now working with Argentine coach Horacio Rearte. "I played a really good game. He made a couple of errors at the beginning of the game, which helped me out, but I just was trying to think just keep playing the way you have been playing the whole match and you'll get through it." Golding hit a huge first serve and an even more impressive forehand winner to earn three match points. Vesely's forehand forced Golding into an error on the first, but on the second, Golding hit a clean backhand winner, claiming the first junior slam title for a British boy since Andy Murray won in New York in 2004. Holding his arms high above his head, racquet in hand, Golding roared his delight, posing for a few seconds while facing his coach and manager before heading to the net to shake hands with his friend and occasional practice partner. Unlike Min, who did not lose a set in her six victories, Golding had two three-set matches, needing a comeback after dropping the first set to No. 6 seed Filip Horansky of Slovakia in Friday's quarterfinals. "It's been a really tough few days," said Golding. "There have been so many matches. I mean, I've played seven matches now in three days. He was obviously pretty tired, as well. But considering the circumstances, I think it was a pretty high-quality match." Vesely had nothing but praise for his friend's performance in his first junior slam singles final. "Ollie played really good tennis," said the Australian Open boys champion. "He didn't give me any easy shots, and I didn't put him under any pressure." Golding will start playing Futures events later this month, probably in Sweden, but will wait to see the ITF junior rankings before deciding if he will play the remaining important junior events in 2011. "I've got to look at the rankings, because maybe there will be a chance now of me finishing the year No. 1," Golding said. "So that's something we will think about, but probably I won't play another junior tournament." In the girls doubles final, No. 6 Irina Khromacheva of Russia and Demi Schuurs of the Netherlands defeated unseeded American wild cards Gabby Andrews and Taylor Townsend 6-4, 5-7, 10-5 to claim the championship. Schuurs has reached the doubles finals in all four junior slams this year, with different partners each time, winning the Australian with An-Sophie Mestach, and losing at the French to Khromacheva and her partner Maryna Zanevska and again at Wimbledon to Min and Eugenie Bouchard. The two days of rain early in the tournament resulted in a slew of walkovers, but both teams in the finals played all five of their matches. In the final, Andrews and Townsend recovered from a break down in the second set to force a match tiebreaker, but the more experienced pair were too steady for the 14-year-old Andrews and 15-year-old Townsend, playing in their first junior slam final. "They're two good champions," said Andrews. "And we're just right there, in that same line. So next year, I think we'll play better. I think we'll learn from this match, and just keep on looking forward after this." "We were a little bit nervous," said Townsend, who reached the third round of the women's doubles with Jessica Pegula. "In the second set, we loosened up a bit and started playing more aggressive, were poaching more. In the tiebreaker, we got a little more tentative, both of us, and I think they did too." On match point however, Schuurs shook off any nerves and hit a clean forehand volley winner, with a scream from Khromacheva and a emotional embrace following in quick succession. The boys doubles title went to the unseeded German team of Robin Kern and Julian Lenz, who defeated Maxim Dubarenco of Moldova and Vladyslav Manafov of Ukraine 7-5, 6-4. Additional coverage of the girls final and the boys final can also be found at usopen.org. American Grace Min survived a two-hour rain delay and a determined effort from qualifier Nicole Gibbs, claiming a 6-3, 6-3 victory and a spot in the 2011 US Open girls singles final against top seed Caroline Garcia of France. Then unseeded Min, who has yet to drop a set in the tournament, came out ready to play in Saturday morning's semifinal, serving well and returning even better. 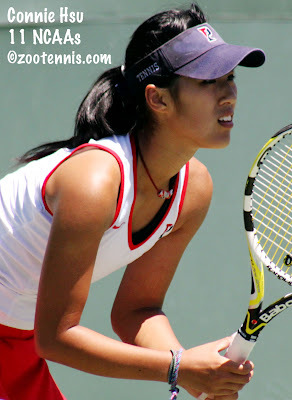 The 17-year-old from Duluth, Ga. had lost badly to Gibbs in the Vancouver Challenger qualifying last month, but in Saturday's match, Min used all her variety to dictate the action over a fatigued Gibbs. Gibbs didn't look particularly sharp in the opening set, but much of that was due to the play of Min, who made first serves and hit winners while breaking Gibbs the first three times she served. The second set had just begun when a few sprinkles began to dot the court, and after a very short suspension of play, Gibbs and Min were sent back on court a 1-1. Gibbs trailed 15-30 in that game when a brief but heavy shower hit, sending players and officials alike scurrying off the court. Gibbs could only hope the disruption would cool off her sizzling opponent. "When you're playing a player that's that hot, you've got to hope the rain delay is going to put some doubt in their mind as to whether they can keep it up," said Gibbs, a sophomore at Stanford University. "I almost feel like she played better after the rain delay. It was consistently just really, really solid tennis. Yes, I made some errors there to kind of aid the momentum, but I don't think I played bad per se." Min picked up right where she left off after the courts were dried, nearly two hours later. She broke Gibbs to take a 2-1 lead, saved a break point in the next game with an ace, and kept Gibbs scrambling and defending. "I like to use my forehand, and she gets a lot of balls back, so I thought I needed to close a few points at the net," said Min, who had never been past the third round in a junior slam until this week. "I didn't want to get stuck in long, cross court exchanges. I'd played a lot of matches, but she had gone through qualies, played the women's qualies and also doubles, so I knew she was feeling it a little bit. But she's pretty fit, so I wasn't going to take anything for granted, try to take advantage of the physicality of the match." Gibbs, who had her left thigh heavily wrapped throughout the week, admitted to some fatigue after playing 16 sets of tennis in three days. "I've been taping my leg all week, with a lot of fatigue on that side of my body," said Gibbs. "However, I think today was much more about my opponent than myself. I've never seen her play that well in a tennis match." After a particular impressive angled backhand slice winner late in the first set, Gibbs could only give a wry smile. "At that point I had watched so many balls go by me, it was bordering on ridiculous," Gibbs said. "I would pull her off the court, hit it up the line, she would barely get there and then she'd hit a sick cross court shot and is on offense, finishing the point on the next shot. Again, more power to her, and hopefully she can continue that tomorrow." Min knows she will need to return to that level against Garcia, who beat Wimbledon girls champion and No. 3 seed Ashleigh Barty of Australia 6-3, 6-2 today, after leading 6-3, 5-2 when rain halted play. "I watched her match against Sharapova at the French," said Min, recalling the second round match that saw Garcia take a set and a break lead before falling in three sets. "She's obviously a great player. She has a big serve, just a big game in general, so I'm going to have to play some good defense and make her hit a lot of balls." The boys final will see No. 1 seed Jiri Vesely of the Czech Republic going for his second junior slam of 2011 against Great Britain's Oliver Golding, who is in his first singles final at a junior slam. Vesely and Golding are good friends and have played doubles together at big events, reaching the doubles final in New York last September and the Wimbledon final this summer, after having captured the Youth Olympic Games gold medal last summer. "We know each other well, so it's going to be a tough match," said the 6-foot-6 Vesely, who won the Australian Open boys title back in January. "Having to win six matches before the tournament starts seems like a very long way. I didn't lose a set, so I've saved some energy, but it will be a very tough match." Vesely took out unseeded Kyle Edmund of Great Britain 6-4, 6-2, and although Vesely was impressed with the 16-year-old, saying he would win a junior slam in the next two years, it was Vesely who controlled the later stages of the match. Staying in the points and using less power and more disguise, the 18-year-old Vesely rattled Edmund, who had never been past the second round of a junior slam. Golding, the No. 13 seed, took the first nine games from friend and compatriot George Morgan, but Morgan, the reigning Orange Bowl champion, fought back to make it a match before falling 6-0, 7-6(2). "I knew the second set wasn't going to be as easy as the first," said the 17-year-old Golding. "I saved a couple of break points in the first game of the second set and maybe was a bit unlucky not to hold to go 5-2 up in the second. At that point, nerves really started to kick in. But I played a really good tiebreaker." Although Golding and Vesely have never played, Golding believes their doubles relationship has given him some insight into strategy for the match. "I think we know each other's games pretty well," said Golding. "We practice together quite a lot. I think I have a good chance, the way I'm playing." 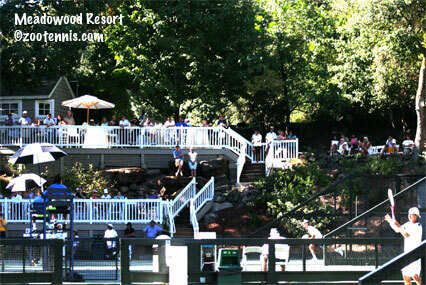 Both the girls and boys singles finals are scheduled for noon on Sunday. Two days of rain in the middle of the tournament led to four rounds of doubles in two days for most teams, with the finals pushed back to Sunday, rather than their usual Saturday finish. Two unseeded boys teams will meet for the championship, with Robin Kern and Julian Lenz of Germany playing Maxim Dubarenko of Moldova and Vladyslav Manafov of Ukraine. 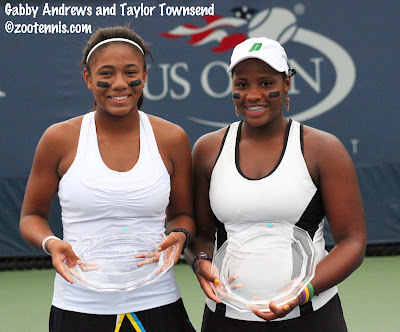 The girls doubles final also features an unseeded team, with Americans Gabby Andrews and Taylor Townsend facing No. 6 seed Irina Khromacheva of Russia and Demi Schuurs of the Netherlands. Due to a three-hour plus wheelchair match on their court, Andrews and Townsend didn't begin their semifinal until after 10 p.m., but the long wait between matches didn't have any noticeable impact on the pair, who defeated No. 8 seed Jesika Maleckova of the Czech Republic and Aliaksandra Sasnovich of Belarus 6-1, 6-4. The doubles finals will be after the singles finals on Courts 7 and 11. For junior draws, see usopen.org. In the category of unexpected grand slam champions, it would be hard to top the fresh-faced pair that captured the 2011 mixed doubles trophy at the US Open. Nineteen-year-old Melanie Oudin and 18-year-old Jack Sock, a wild card entry playing together for the first time, beat No. 8 seeds Gisela Dulko and Eduardo Schwank of Argentina 7-6(4), 4-6, 10-8 Friday evening to give the United States its first championship of the tournament. Playing on Arthur Ashe stadium, where both John Isner and Andy Roddick had fallen in the quarterfinals, Oudin and Sock lifted the spirits of the thousands of fans who stuck around looking for a more positive ending to their tennis day. Starting slowly, Sock and Oudin fell behind 3-1, but got the break back in the sixth game, and in the tiebreaker, held the slimmest of leads, getting a mini-break when Schwank double faulted at 1-1. Sock and Oudin held serve giving themselves three set points at 6-3. Schwank saved one, but Oudin hit a clean forehand return winner off a Schwank second serve, a shot that energized the crowd even more. The second set saw no breaks and not even a deciding point in the no-ad format. Although Sock had served well throughout the match, he was broken for the first time serving at 4-5, which meant he and Oudin would need to win their third match tiebreaker of the tournament to satisfy the fans. They didn't get off to the best of starts, trailing 4-2 at the first changeover, but the chants of USA, USA seemed to have their effect. Oudin hit a running forehand winner that got them started and the teenagers went on to win five of the next six points to take a lead 7-5 at the second changeover. Dulko then double faulted, which gave the Americans a little breathing room, and after a Dulko poach made it 8-6, Schwank missed a forehand return to give Sock and Oudin three match points. Schwank saved two of them, although he needed an assist from Hawkeye on the first one, when his second serve was called out, but reversed on review. At 9-8, the match hinged on Sock's serve, a situation that suited him just fine. "I felt comfortable serving all week, so I think I was pretty positive about it and felt like I was probably hitting a good serve," said Sock. He did, and Schwank, lunging for the ball, sent it just long. 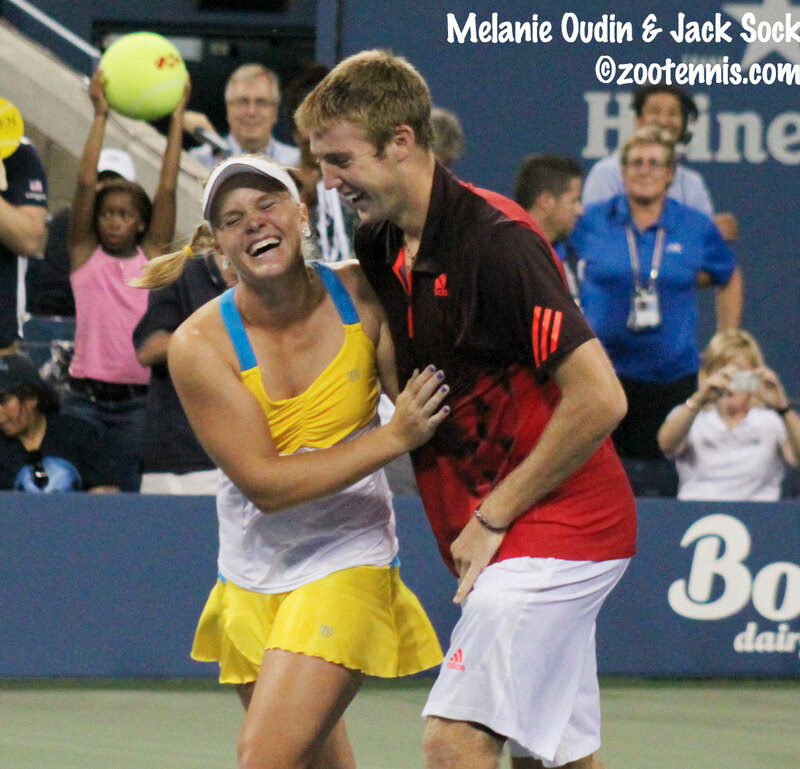 Sock dropped his racquet and ran to hug Oudin, while the crowd rose in unison to applaud the unlikely champions. "For me it was a lot of fun," said Sock, who according to Oudin, kept the tension down all week with his jokes and comments. "I think that's kind of why we have been doing well this week. It's been like that all tournament for us, kind of just like playing loose, swinging, and having a good time. I think that's where the success came from, too." Oudin, whose Cinderella run to the US Open quarterfinals in 2009 was the highlight of her grand slam participation until now, remarked on their good fortune in saving a match point in their first round contest against Vladimira Uhlirova and Filip Polasek, and their ability to keep that momentum. "Sometimes like getting through that, a little bit lucky here and there, and who knows? You can end up winning the title," said Oudin. Mixed doubles records are difficult to find and confirm, but at age 18, Sock is the youngest man to win a US Open mixed doubles title in the Open era, and their combined age of 37 is the same as that of Belarus' Max Mirnyi, who was 21, and American Serena Williams, who was 16 at the time of their championship in 1998. The complete mixed doubles draw can be found at usopen.org.